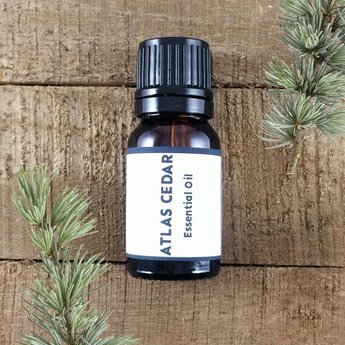 Atlas Cedarwood oil (Cedrus atlantica) an amber liquid, is a woodsy bouquet with a delicate sweet undertone. This cooling oil relieves nervous tension and other stress related disorders. A grounding oil that clears the mind and opens the sinuses and nasal passageways. Diffuser: Atlas cedar works well in a diffuser by itself or you can blend with oils such as black spruce, rosemary and peppermint to bring a clean, energetic yet calming blend into the room. Add a couple of drops to a facial steam bath to clear sinuses (great with peppermint and eucalyptus). Put one drop on pillow before bed to encourage dreaming. Add to temples and pulse points during a meditation. bergamot, black spruce, chamomile, clary sage, cypress, frankincense, jasmine, juniper berry, lavender, myrrh, patchouli, vetiver, vanilla and ylang ylang. Fun facts: Cedarwood was highly prized by the Egyptians for use in cosmetics and was burned in temples in Egypt and Greece. The first cedar planted in Britain, in 1646 is still loving today.